Krautrock never sounded like this. The four-piece hard rock Germans who called themselves Epitaph had no time for arty experimentalism or stoned improvisations. What they were up for was good old four on the floor blooze-rock boogie, and with 1974′s Outside The Law, they delivered. Much of the reason things worked so well for them so well was the fact that they knew who they were from the very beginning. They liked to rock Southern style, and did so in English, for maximum effect. It is unfortunate that management difficulties kept them from finding success in the States, because with the right promotion these guys would have had a real chance at making it. This is apparent right from the top with their Alllman’s inspired “Reflection.” It is sort of a German “Ramblin’ Man,” and a great lead-off for this their third and final album. The group leave plenty of room for guitar solos, courtesy of Cliff Jackson and Klaus Walz – who take ample advantage during songs such as the title track. “Tequila Shuffle” is another example of their great dueling guitars. Towards the end, both players face off as if re-enacting the axe-duel at the close of the old Ralph Macchio finds-the-blues flick Crossroads (1986). As a nod to the times, the album concludes with an extended magnum opus; “Fresh Air.” You gotta love it when a band take four minutes just to find the riff. To their credit, when Epitaph lock into the groove, they do not let it go for nine solid minutes. Thanks to the previously mentioned management troubles, which at one point saw the diminutive Irving Azoff ready to sign them, Epitaph broke up after Outside The Law. They did however record three songs in 1976 for what would have been their fourth album. The MIG label has just released Outside The Law on CD for the first time, and have included those later sessions as bonus tracks. These three tunes actually bode quite well for a “might have been” scenario. “Train To The City” is much less derivative of the Southern rock thing, and in fact reminds me a bit of something off Blue Oyster Cult’s Agents Of Fortune album from the same year. Likewise “Wasted So Much Time” is a road-weary track that could have fit next to “Movin’ On” from Bad Company’s debut. The other Bicentennial year entry is “Kind Of A Man,” which has classic Allman Brothers written all over it, but that’s just fine – if you are going to be influenced by another group, the original Allmans make one hell of a template. The four remaining extra cuts hail from a reunion concert which took place in 2000. Three of the these are from Outside The Law: “Woman,” “Outside The Law,” and “Big City.” “Jim’s Thing – Drum Solo” features three minutes of Jim McGillivry beating the holy crap out of his skins, and bringing us back to the good old days of the drum solo. This new edition includes seven extra tracks, and they are well worth buying this disc! British progressive heavy rock bands like Deep Purple, Black Sabbath, Uriah Heep and Led Zeppelin inspired many young bands in Germany. The Germans usually preferred to use English lyrics, and several bands, like Blackwater Park, 2066 & Then and Epitaph, had British vocalists! Epitaph were founded in Dortmund in 1969, consisting of Cliff Jackson (vocals, guitar), Bernd Kolbe (bass, mellotron, vocals) and Jim McGillivray (drums). The first sessions for their debut album, released 1971 on Polydor, were recorded in an Essex studio in England. For unknown reasons, it was however finished in Windrose Studios, Hamburg, where a fourth member was added to the group: Klaus Walz (guitar, vocals). The five resulting tracks sounded similar to the groups mentioned above, and particularly the earliest incarnation of Uriah Heep. Epitaph's Cliff Jackson didn't attempt to copy Byron's operatic vocal style, though. There were both fast rock'n'roll numbers and slow ballads with mellotron textures, usually in the 'heavy progressive standard song length' - from 5 to 7 minutes. 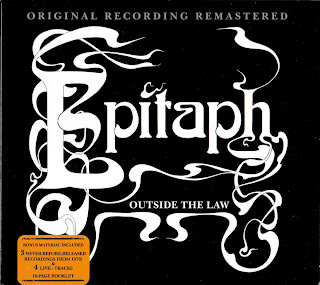 In 1972, Epitaph recorded their second album, "Stop, Look And Listen" in Audio Tonstudio, Berlin. This album also contained five tracks, stylistically similar to their first offering. Both albums are recommended for fans of the heavy progressive genre. In early 1973, Epitaph released two non-LP singles on the Polydor subsidiary Zebra: "Autumn '71" coupled with "Are You Ready" (2047 003) and "We Love You Alice" coupled with "Paradise For Sale" (2047 005). After this promising start, it seems as if the band was promised a bright future by the newly founded American record company Billingsgate, that they eventually signed to. The band invested much time and money into their third album, "Outside The Law" (1974), and aimed at an international break-through. On this album, McGillivray was replaced with Achim Wielert (drums, percussion). The music sounded more polished this time, as the band abandoned progressive elements for a more straight forward heavy rock style. 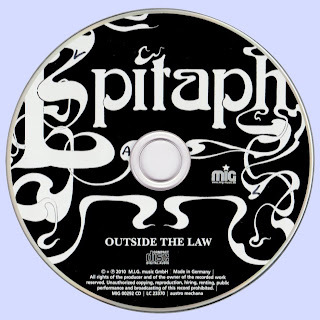 Recorded in November 1973 at the Omega studios in Chicago, Outside the Law is undoubtedly still the definitive Epitaph album. The sound engineer was Dave "Grape" Purple, who won the 1971 Grammy for Best Engineered Recording on Isaac Hayes' Theme from Shaft. The recording of "Outside the Law" was completed in just 5 days, with very few overdubs, and the final mix was done by Ed Cody at the United Technique studio on Chicago's South Side. So how does a German rock band get to be recorded by studios and engineers who built their reputations on black music - and produce such a brilliant album? In early summer 1972, Epitaph did a mind-blowing rock festival gig at Berlin's Waldbühne stadium. Also present that day was Gary Pollack, head of Billingsgate Records, who stopped Cliff Jackson on the way to the dressing room with the announcement that "in six weeks you guys will be doing a US tour". Knowing that no German rock bands had ever toured or recorded in the USA before, Cliff and the guys were somewhat sceptical about the project. But sure enough, Epitaph landed at Chicago's O'Hare Airport in August 1972 for a successful twenty-day tour. Returning on a cloud of euphoria to the band residence near Visselhovede in northern Germany (plenty of poets, painters, animals, and ladies, but no heating, no bath, and only an outside toilet) work commenced on a new album. The demo was recorded two months later at the Windrose Studio in Hamburg and then sent over to Gary Pollack, who invited the band to come back to Chicago to do the full recording of Outside the Law. While Billingsgate was preparing the release of the album, Epitaph spent their time gigging around the Chicago area. It was around this time that Irving Azoff, then managing Joe Walsh, wanted to take Epitaph under his wing. The band met up with him for two days to try and work out a deal, but the German manager they already had developed some seriously cold feet. Bearing in mind that their manager, Werner Kuhls, did not speak a word of English, it was hard to comprehend just which of Azoff's propositions he was objecting to. The net result was that Epitaph couldn't get out of the contract with Kuhls, and Kuhls was dreaming of hitting the big time. Ordered back to Germany for a Europe-wide tour, it was soon clear that Kuhls was no Azoff. The tour turned out to be fronting for Status Quo, and one festival gig. Azoff went on to represent such artists as The Eagles, Jewel, Van Halen, Neil Diamond, Steely Dan, Guns N' Roses, and Christina Aguilera, to name but a few. Werner Kuhls went on to be a concert promoter and publisher of the German version of Rolling Stone. Now without a manager, Epitaph hoped for success with Billingsgate. When they returned to the US for their third tour in late 1974, it soon became clear that despite excellent sales of the album, Billingsgate was in dire straits and unable to finance a proper promotional tour. Two months of sporadic gigs later, the guys returned to Germany.